With the school holidays fast approaching what better way to keep those young minds in tip top condition than with this just updated education app, Elevated Math. Elevated Math contains lessons that cover place value, estimation, large digit addition all the way through Algebra I (two years of math instruction!). The app comes with two complimentary lessons and one complimentary career video. Teacher notes and student materials for all lessons are free. You can download this app here for free. With the hands-on uniqueness of the iPad platform, students can now be more engaged than ever, learning at their own pace and moving on with no gaps. This is education with fingertip precision. 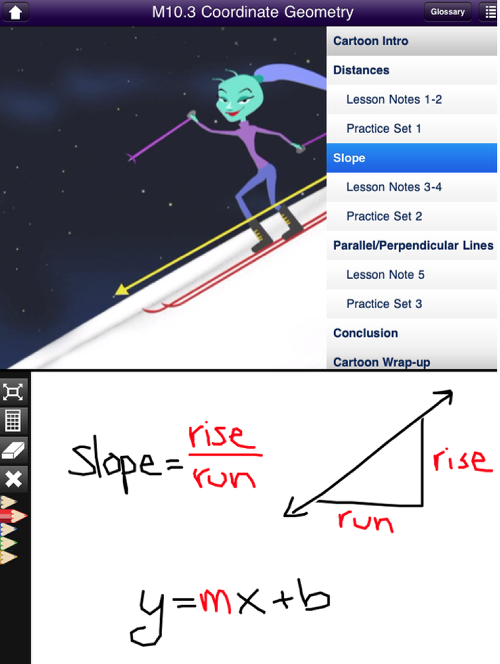 And built within the precise animation, voiceovers, and lesson landscape of the Elevated Math app is each student’s personal whiteboard for working out their own individual math problems. 120+ hours of instruction with 70+ hours of quality animation are available. – Numbers and Operations – 40 lessons on whole number operations, integers, fractions, decimals, factors, decimal operations, exponents, powers, computational fluency of fractions, ratio, proportion, and percent. - Measurement – 12 lessons on attributes and tools (the units, systems, processes, applications of measurement, and estimation), and perimeter, area, and volume. - Data analysis and probability – 9 lessons include selecting and using appropriate statistical methods for data analysis, developing inferences and predictions based on data, and applying basic concepts of probability typically covered in grades 6-8. Top college entrance exam tutors have bundled specific lessons deemed highly relevant for raising SAT and ACT test scores. 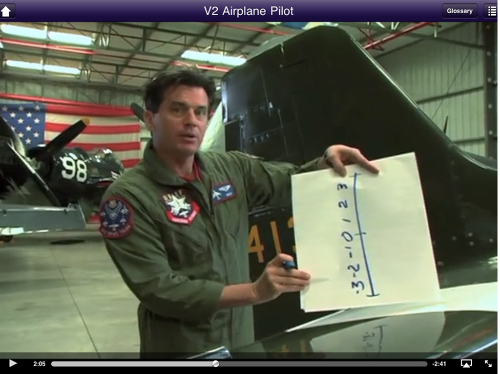 Included in the app are a series of career-oriented live-action videos that answer the frequent question: “Why do we need to learn this stuff?” These documentaries focus on individuals who are using math in their jobs and include a jazz musician, a stunt pilot, an animator, a landscape architect, a chocolatier, and fifteen others. An amazing amount of student print material and teacher notes that support the Elevated Math lessons are free for download on the elevatedmath.com website. Also, coming within the next week will be eleven institution app versions of Elevated Math where the lessons are embedded in the app. This will allow schools to take advantage of Apple’s volume discount program.